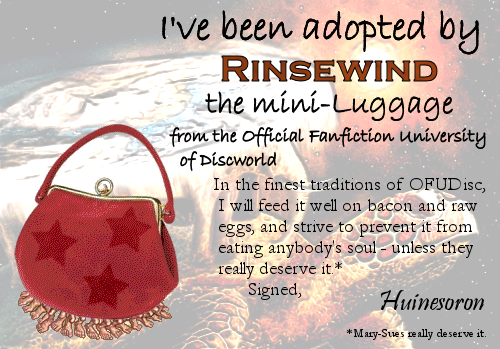 In the grand tradition of Fanfiction Universities, OFUDisc is seeking to send all of its mini-Luggages to good homes. As the minis are spawned by the endless misspelling of canon names, they will be listed here. To adopt a mini, simply select one without a home, and leave a comment here specifying the name under which you wish to adopt it. Your name will be noted as the mini's official adopter, and you will be given a special certificate of ownership, either in reply to your comment or by email. To keep things fair, we're keeping things on a one-mini-per-person, first-come-first-served basis. Additionally, if you have previously adopted a mini-Luggage (freelance, as it were), we encourage you to register them here so we can add them to the list. All previous adopters will receive credit and a certificate - and if two people have contrived to adopt the same mini, we'll organise some sort of time-share. Any PPC writers who want their Agent to also adopt their mini - that's fine. Let us know, and we'll issue twin adoption certificates.